The Happ family has been beyond busy all. Not only have we spent the past few months preparing for our little one, but we had also been diligently hunting for our first home. After what seems like over 100 houses later, we found our winner. Blog family, meet our new cottage in the city. Isn't she cute? We are lucky enough to have our apartment still for a bit while we do some renovations on the inside before moving in. Let's just say the wallpaper, plush white carpet and pretty much all decor were not our style - but we were sold on the location, potential and adorable curb appeal - and I choose to believe it just gives us a chance to make it fully "our own". Get ready for some serious, budget friendly home update posts here in the future. That being said, one of the things we are really excited about in moving to a neighborhood is having neighbors! Within the first few days of closing, we received food, cards, "hellos" you name it from those surrounding our new little abode, and it could not reassure me more about the choice that we made. I often feel like that community feel that used to be so rich in many neighborhoods has sort of gone to the wayside in many places, but knowing our neighbors is still an ideal I hold dear - especially when we are bringing our new bundle of joy into the mix. Thus, I decided I would set out to get a good start on the welcome train as well and bring our neighbors a delicious little "hello" offering. This little gem was inspired originally by this post from the Army Wife Network. 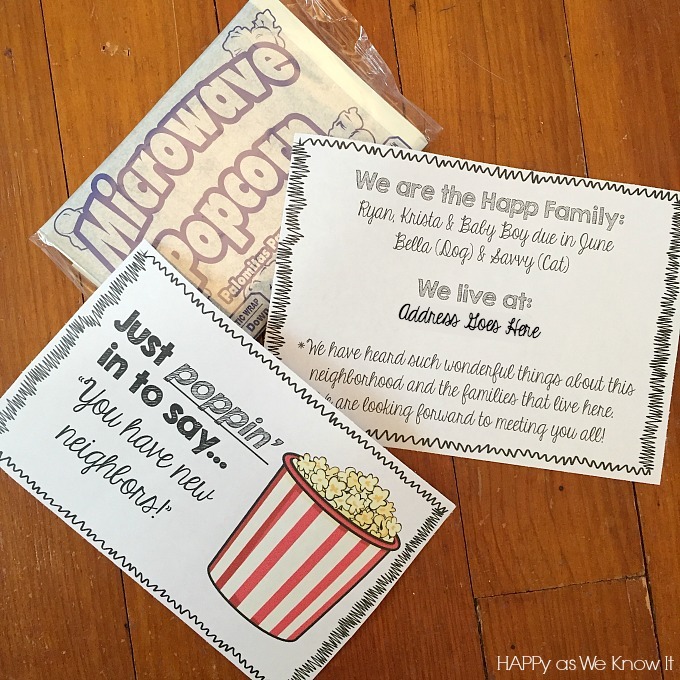 To create mine, I simply purchased two boxes of microwaveable popcorn, set to creating the topper and info pages and tied it all together with some ribbon flair. Then I set to the fun part of delivery. I was able to chat with and meet several neighbors that were out and about as I made my rounds, and those that were not I simply left our bundle of fun at their doors for later. This was such a simple way to begin to foster that comfort level among our neighbors, and I look forward to seeing all that's in store for our family as we begin this new adventure in our new community. 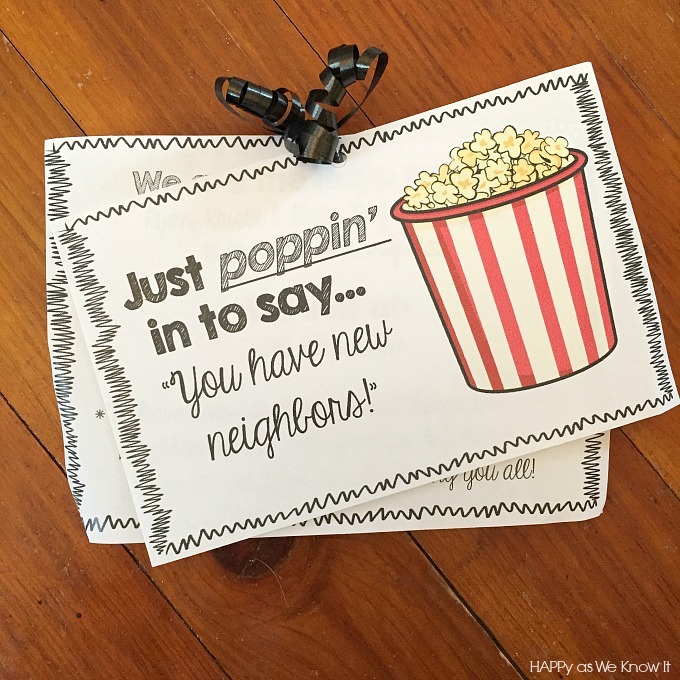 If your interested in making your own welcome gift for your new neighbors, you can snag the template here. That's genius!!!! What an awesome idea! So CUTE! Is this available as a downloadable template? I could certainly send you a copy if you'd like - feel free to shoot me an email @happyasweknowit@gmail.com if you are interested! I added a link to the template to this post for all to us :)! I added a link to the template to this post for all to use :)! I added a link to the template to this post for all to use! I may be blind, but i cant find your link to the template. Can i get the link please. It's at the very end of the text... "here" in red. I had trouble finding it too. Thanks for sharing the template! What fonts did you use so I can match the customized second page? Can you add a blank template as well, to write new neighbor information on it? How do we get the other page to write our 411 on it? :) Thanks so much! Great idea! We just got a house today! Congrats on your new home. I didn't actually make the other page editable at this time. If you want to shoot me your email address, I can see what I can do with it here in the next couple days and send it in your direction.